I thought I went to Haiti to do some stuff; instead, God took me to Haiti to show me some stuff. Then my heart was stretched so wide you could fit all of Texas in there. I went to Haiti to do work with women in displacement camps turned villages, in order to better understand the needs and perpetual problems that come from having to leave everything you knew for somewhere else, having nothing, and gaining little, but being brave and starting again. This work eventually melded into Haitian-led projects, which included community gardens, women’s health workshops, as well as a language and writing class. It was good work. I loved it. But I knew deep down it wasn’t necessary. It was nice, but not necessary, and sometimes that’s ok.
One thing people don’t realize about cultures like Haiti is that while we look and only see need, they are waiting patiently to teach us what they know. We have poverty of community. I can only speak for American culture. I’d be interested to hear from other spots around the world, but over here we’ve been on a slow fade from connection to isolation at least since post World War II. There are probably a hundred factors included we could list, and not one would be enough on its own. Now, though, we are simply left with the reality of this poverty, as well as where it’s left us, our families, and our neighborhoods. We reek of loneliness and isolation. We all may be connected, even related in some communities, but spend little time together. We walk around in an “I’m fine” culture, with “I’m fine” families, going through our “I’m fine” days, and it is destroying us. We have anxiety, and if we don’t, our children do. We incessantly need more and better. We are lost without technology, not so we can connect, but so we can be busy. We have exchanged relationship for judgement, doing it right, and being a little bit better. I am just as guilty as the next person. I like “I’m fine.” It’s cozy, easier than reaching out, and manageable most of the time. Let me introduce you to the kind of community I experienced in Haiti, whose people are far from perfect, a country plagued with problems, full of sinners, just like every other spot on the map, but also just like anywhere else, full of lessons to teach us to love brave. The women in Haiti taught me that loving brave includes having faith when you really want to throw it out the window. Faith is the substance of life, when everything else passes away, and we can’t make it through any of the junk without it. They also taught me that faith without love and life together will only be half a faith, useful for myself, bringing salvation, but robbing me of a life with God’s people now, God’s love and light shining in my life through them. …if I have all faith, so as to remove mountains, but have not love, I am nothing. The last time I went to Haiti my only goal was to spend time with Her people. I brought other women with me because I wanted them to see what could happen when relationships came first and doing came second. We visited women who are part of an elder care program and prayed with them. We talked with a family about their new goats, gifted to them through a sponsorship program. We met with married women, single women, women with children, women taking care of other’s children. We did women things like sharing stories, painting one another’s nails, eating, and inviting friends along. We talked about loss, finding our value in things beyond men, things that have made us strong. We did all of this connecting around Truth spoken by God, because without that, we would just be making stuff up. That’s part of the bravery of reaching across to someone else in love — truth is just as important. Discussions without truth, relationships without accountability are just mush. Truth is part of love that moves mountains and I’m thankful for the women and men in my life here at home in the US and all around the world who have shared it with me. Poverty comes in many forms. 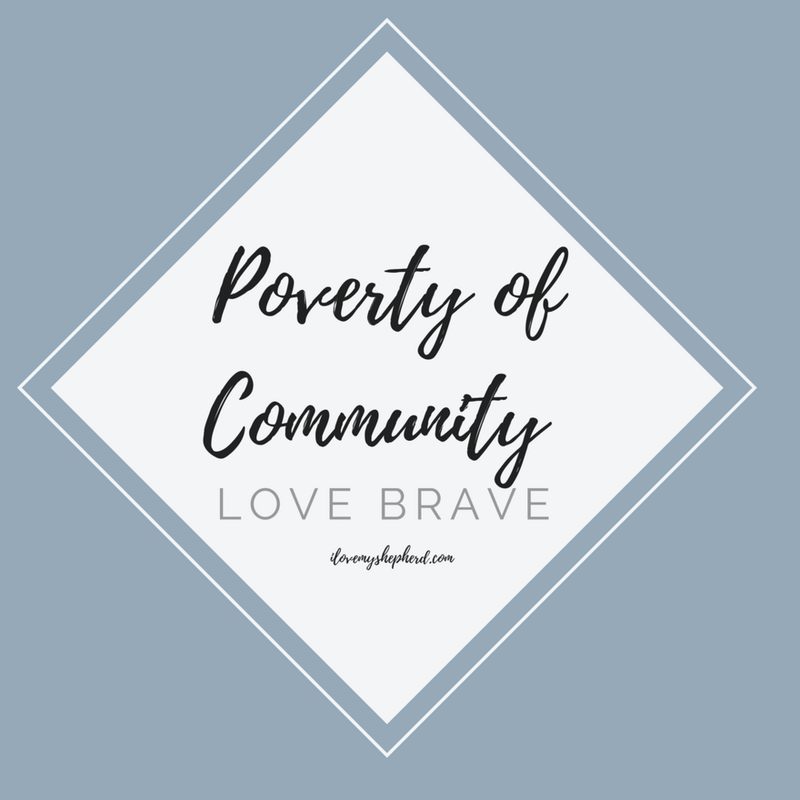 Together we can work to close the gaps that allow poverty to spread so wide and thresh so much of this globe, but together we can also close the gaps of community that leaves us all feeling like a big bundle of nothing. We are made to be something…together. There’s a mindset I’ve observed when people talk about poverty. Oftentimes, it’s us versus them, two different, distinct, diverged people. If we are the "haves", then we look at the “have nots” with dismay or disdain. I think Heidi’s words reveal this mindset as ungodly and unbiblical. There’s no us and them, there’s simply all of us together, and God. We all lack. We bring nothing to the table. We’ve exchanged true relationship with Him, and with others, for superficial relationships online and even in person. We can have the same five-minute conversations about the weather, work, and how busy we are. We can ask the same “How are you doing?” question and pray that they answer with one of three reasonable responses: “I’m good.”, “I’m busy.” or “I’m tired.” and we can nod in agreement. But what if they’re honest? What if we’re honest? What if we confess to God and to each other that we are longing for something more? What if God answers our confession with provision by providing us people in relationship that would create community? He has. He can. Do we think he will?